Czechoslovakian Charlotte beads: are glass seed beads that have been faceted on one side which causes them to sparkle under the light; giving the Charlotte bead its distinctive beauty. 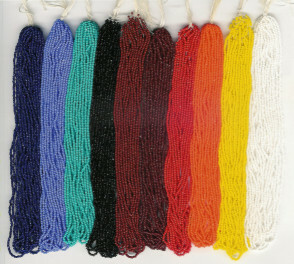 Our 13/o Charlotte hanks contain approximately 2,600 beads. Smaller hanks (where noted) are half the size of our regular hanks and contain approximately 1,300 beads. Czechoslovakian Three-Cut beads: are very similar to the traditional Charlotte bead, except that they contain three facets rather than one. The facets on these tiny beads are what makes them sparkle under the light, thus giving them their distinct beauty. Our 12/o 3-cuts are very close in size to 13/o Charlottes and mix well with them. There are approximately 3,100 beads per hank. Our 13/o 3-cuts contain approximately 2,600 beads per hank.